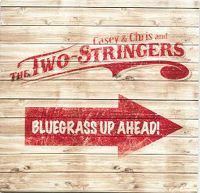 Casey and Chris and the Two-Stringers was the short-lived band headed by Casey and Chris Henry. Along with Amanda Kowalski on bass and Tyler Grant on guitar they played hard-driving traditional bluegrass, with an original twist. This CD features five of their best songs to give fans a taste of what came later on their full-length CD, Get Along Girl. Two Hands On The Wheel, Boxcar Door, Going Back to Old Virginia, Sound I Hear, Gallatin.